The ice is back baby and these are the best Christmas ice rinks to take a spin on in London. 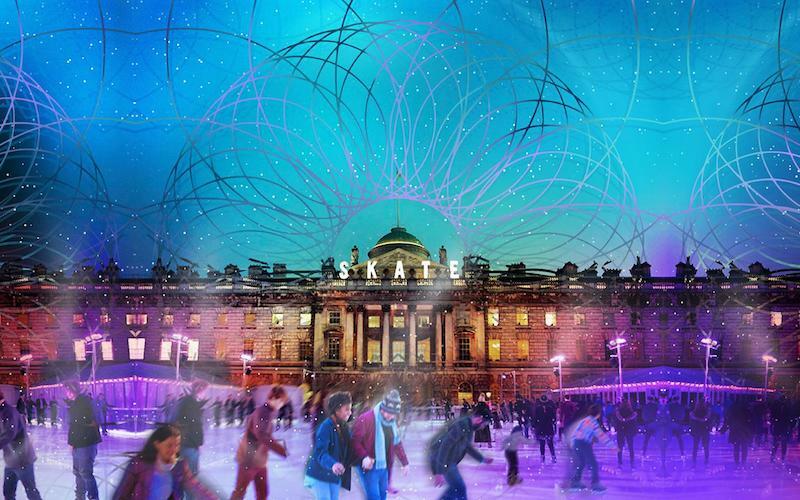 It’s one of the most magical places to get your skates on and the Natural History Museum ice rink is back for another year. Alongside the 30ft Christmas tree, they will also be serving up seasonal treats from The Café Bar, run by Benugo, as well as providing a perfectly positioned viewing balcony to warm your cockles after a spin on the ice accompanied by a fairy tale view. If you get out on the ice on Thursday nights, you’ll also be treated to live acoustic music from breakthrough artists. Someset House is probably one of our fave places to go skating in London and our top pick for date night. As well as being able to whizz around the 900 sqm outdoor rink, you can take to the ice once night falls as they play host to an array of DJs, artists, and clubs. It’s a truly diverse programme with the like of Rock The Belles, Five Miles, and many more. This year enjoy a whole new series of Skate Lates events. 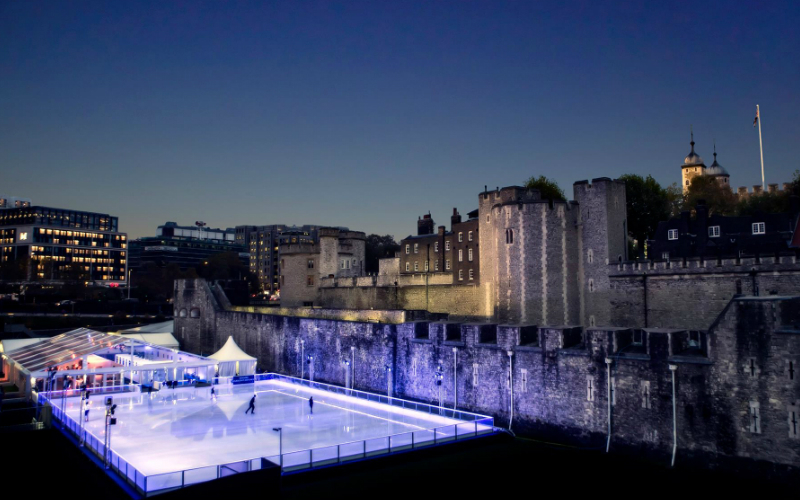 Not only does this rink offer you plenty of ice to show off your moves, it comes with a pretty special backdrop, which gets even better after dark as the Tower gets all lit up. You might even skate past a Beefeater. If you’re more like Bambi on ice, you can spectate (with a mulled wine in hand of course) from the rinkside bar. You know what’s better than an ice rink? 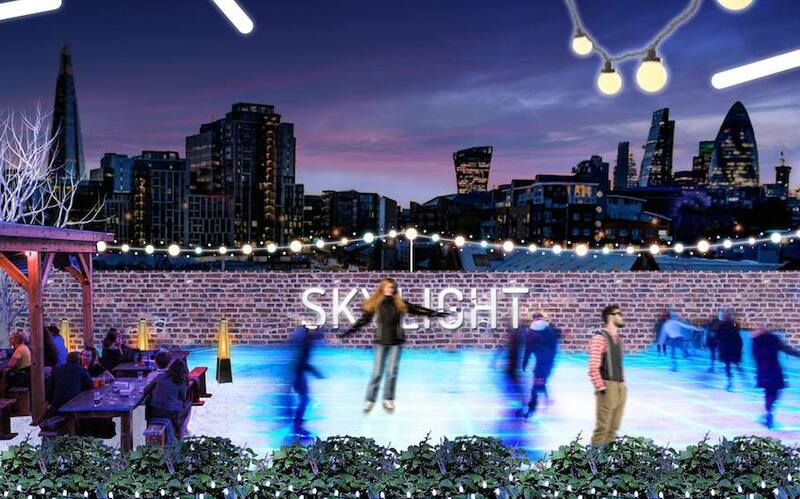 A rooftop ice rink and Skylight’s one is back in action this winter. And it’s not just about the bangin’ views, with wintry tipples, fondue, street food and DJs, you can make a proper night of it too. 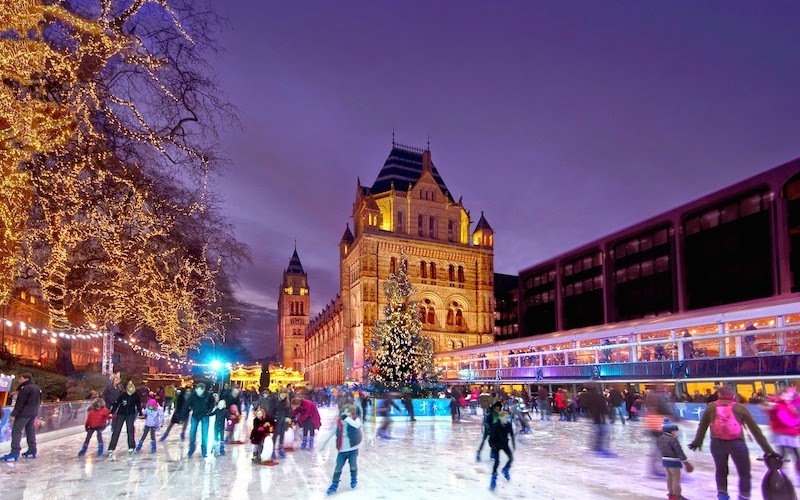 It’s one of the most magical places to get your skates on and the Natural History Museum ice rink is back for another year. Alongside the 30ft Christmas tree, they will also be serving up seasonal treats from The Café Bar, run by Benugo, as well as providing a perfectly positioned viewing balcony to warm your cockles after a spin on the ice accompanied by a fairy tale view. If you get out on the ice on Thursday nights, you’ll also be treated to live acoustic music from breakthrough artists like Laura Oakes, Bang Bang Romeo, Eckoes, and Weird Milk. 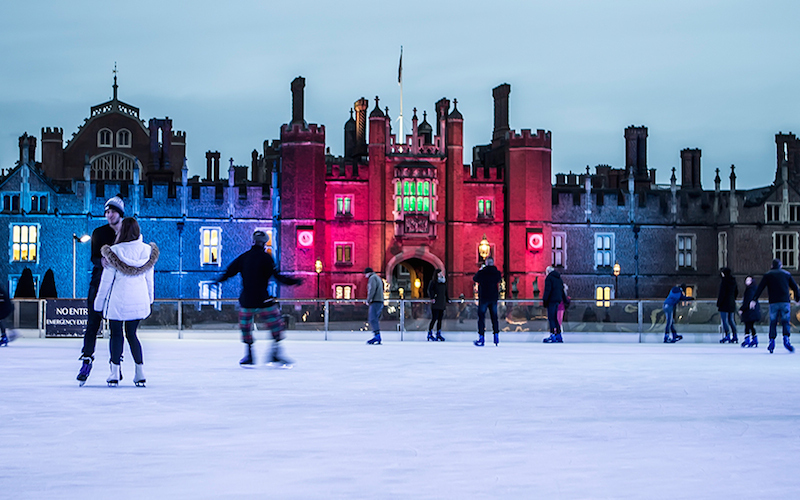 With 11,194 sq ft of ice and a palace as a backdrop, there’s no better place to go for a spin than Hampton Court Palace. And when it comes to refuelling, you’ve got winter treats like plenty of mulled wine and rum punches on offer at the ice rink cafe. YUM. 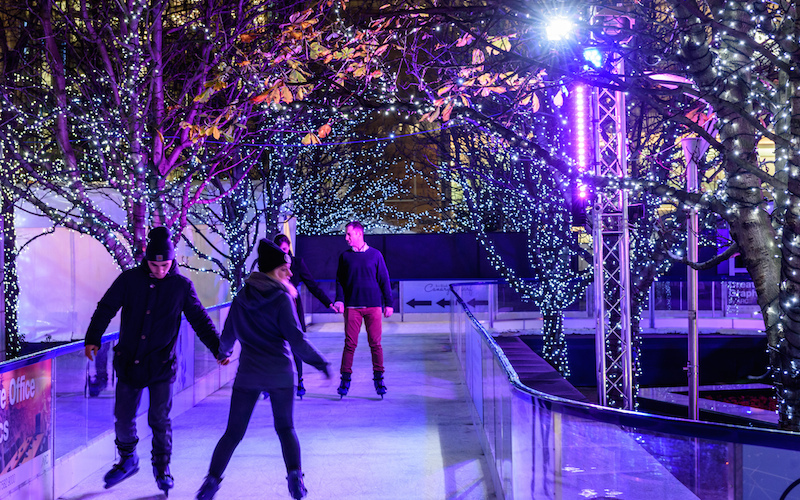 London’s longest ice rink is setting up shop at Canada Square Park for 16 weeks this winter. 80m long with 1300 square metres of ice, there’s plenty space to practise your pirouettes here and when your done all that thirsty work deserve a drink from their winter themed bar. 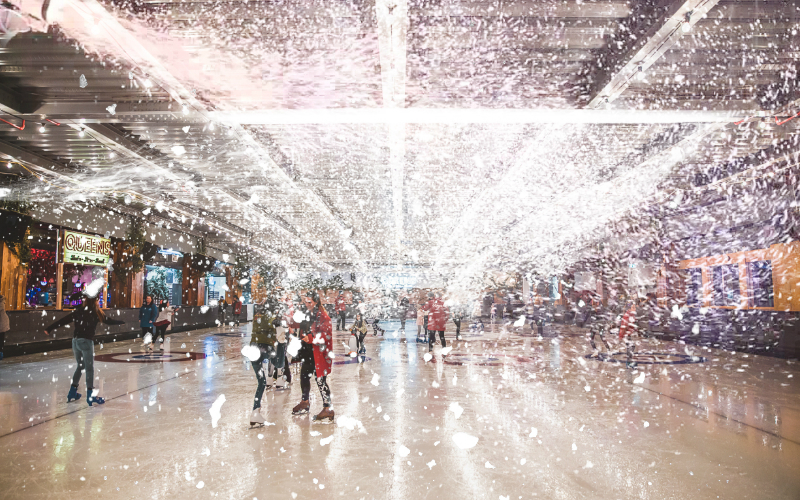 The ice rink at Queens may be there all year round but they’re ramping it up for Christmas with custom snow cannons spraying over the ice. Queens will also be hosting on-ice sing-alongs of Christmas classics and MEATLiquor will be installing the Sin Bin rinkside bar and diner, complete with XXXmas drinks and dirty turkey burgers.